Kiss My Review: Alien Queen!! In Concert!!! One Night Only!!! Alien Queen!! In Concert!!! One Night Only!!! NEW ALIEN QUEEN LIVES AT METRO!! TICKETS ON SALE SATURDAY, 4/9 AT NOON; $16 advance general admission; $20 day of, $30 VIP seating. 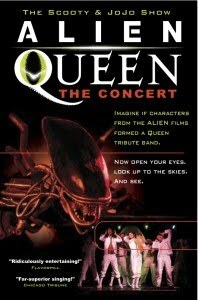 "Alien Queen: The Concert combines the legendary music of Queen with an outrageous parody of the “Alien” films. For the “Concert” we’ve added songs, dancing, and even more absurdity to create a top-notch Queen tribute band featuring those fantastical aliens, cross-gendered humans, and some of Chicago’s best singers and rock musicians. Starting at 9pm on May 13th, The Scooty & JoJo Show and Metro host the full evening of rock and ridiculousness with special guest performances leading up to the incredible Alien Queen: The Concert! The Scooty & JoJo Show premiered Alien Queen: A Sci-fi Rock ParOdyssey in December 2010 and January 2011 at Chicago’s Circuit Nightclub, garnering incredible critical praise and packed houses. The original show, created and staged by Scott Bradley, is a farcical fusion of the Alien film franchise with the iconic sound of British rock band Queen. Featuring classic Queen hits as well as deep cuts from the early Queen catalog, Alien Queen’s transformation into concert form puts the epic music and absurd pageantry front and center"
Created & Directed by Scott Bradley; Musical Direction by Nicholas Davio; Choreography by Jyl Fehrenkamp; Aliens Designed by Jabberwocky Marionettes*; Costume Design by Anna Glowacki; Graphic Artistry by Michael S. Miller; Stage Manager Ellen Willett; Sound Design by Andrew Wheatley; Scenic/Property Artistry by Frances Ahn, T.L. Noble, and Josh Rosenthal. * alien soldiers by Anna Glowacki. ]I'm very excited!! See my review below of "Alien Queen". Get your tickets now! What are you waiting for?? I see you sitting there! Go!